Making the most of daily highs and lows, living and loving the Southern lifestyle because no matter what, stuff happens! 3 yards to be exact. 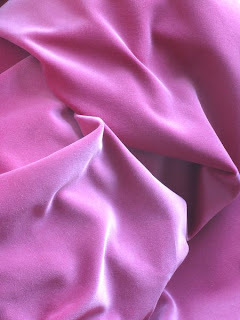 I am going to make beautiful, luxurious throw pillows for my daughters bed. Got to put my thinkin' cap on. Can't wait to get it and get started! Thanks Eddie and Jaithan, you made my day. Cook over low heat. Stir until it reaches a boil, let sit at room temperature until it thickens. Pour over cheese 30 minutes before serving. Sauce would be wonderful served warm over ice cream. Yum! My family was eating the leftover sauce out of the saucepan with spoons when I left home with this. I will be doing Thanksgiving with my family this Sunday as I am traveling to No Georgia on Thanksgiving day to visit DH side of the family. These would make the coolest Christmas, Birthday or wedding gift. These are made from actual photos of items taken around the world, then the artist uses them to create a name or saying. Visit the artist at www.allisonsletters.com to create your own unique picture! I don't know about you, but sometimes I like to try something new. This is an absolutely wonderful, delicious, fabulous fall dessert. I'm not kidding, this stuff is great. Try it out on your family! In large bowl of electric mixer, beat together 2 pkgs cream cheese and 3/4 cup sugar until smooth. Beat in 1 tablespoon flour, 3 eggs and 2 teaspoons vanilla until smooth. In large bowl, combine oil, 1 cup sugar, 2 eggs and 1 teaspoon vanilla, blending thoroughly. Stir in 1 cup flour, baking soda, cinnamon and dash salt, mixing well. Stir in drained pineapple, carrots, coconut and walnuts. Spread 1 1/2 cups carrot cake batter over bottom of greased 9-or 9 1/2-inch springform pan. Drop large spoonfuls of cream cheese batter over carrot cake batter; top with large spoonfuls of remaining carrot cake batter. Repeat with remaining cream cheese batter, spreading evenly with a knife. Do not marble with a knife. Bake in preheated 350 degree oven 50 to 65 minutes or until cake is set and cooked through. When cake is cold, prepare Pineapple Cream Cheese Frosting. In a bowl of electric mixer, combine 2 oz cream cheese, butter, powdered sugar, 1/2 teaspoon vanilla, 1 tablespoon reserved pineapple juice and dash of salt. Final step, prepare for applause and cudos!!!!! That is if you decide to share it! 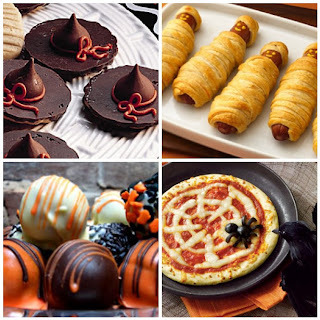 Another cute Halloween Food Idea! Attach 1 chocolate candy to chocolate bottom of each cookie, using decorating icing.Pipe decorating icing around base of milk chocolate candy. I've been finding the cutest Halloween food items this year. For the next few days I'll be posting a couple of them. First up, Witches Hat!! 1. Melt semisweet chocolate according to the package instructions. 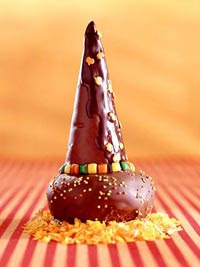 Holding the open end of the cone, dip the bottom half at an angle into the melted chocolate. Immediately press candy pumpkins into the chocolate. Place the cone on waxed paper and let sit until the chocolate sets. 2. Frost the top and side surfaces of a doughnut with icing. Sprinkle icing with nonpareils or sprinkles. Center the open end of the cone on the frosted doughnut. Use a sharp knife to cut candies or gum pieces into quarters and adhere them around the bottom of the hat with icing. Wouldn't this make a cute class party favor for your kids????? I lost my Mom to this disease and now have a friend who was just recently diagnosed, she started her chemo on Monday. Please remind your friends to visit the ob/gyn annually, and to know the systems. bloating, constipation, frequent urgent urination, fatigue and back pain. Visit the Ovarian Cancer Awareness website for more info. - TAP TAP TAP......IS THIS THING ON?